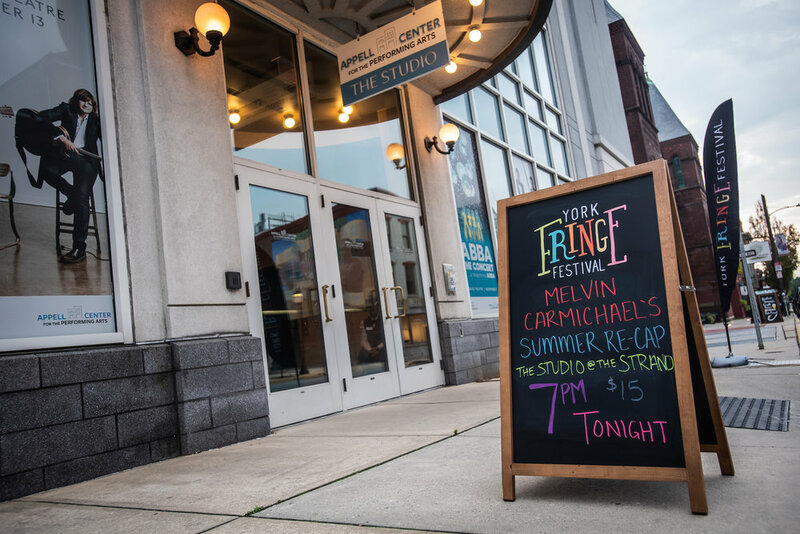 The first ever York Fringe Festival in 2018 brought 30 performances to the city of York, Pennsylvania. The York Fringe will be back again in August of 2019. The York Fringe Festival will take place Wednesday, August 21 through Sunday, August 25, 2019 in tandem with the 2019 YorkFest Fine Arts Festival. Our Mission: To provide a platform for innovative live arts in the City of York. In short: take the Wikipedia entry on theatre, a music festival, and an art gallery, throw them in a blender with some craft beer and frappe until smooth. Drink to experience artistic endeavors like never before! WHAT IS THE LIVE ARTS? The York Fringe is a 501c3 registered non-profit in the state of Pennsylvania. The non-profit organizes the festival each year with the support of artists, donors, and volunteers. Check out the Participant Guide. Arts strengthen the economy. The U.S. Bureau of Economic Analysis reports that the arts and culture sector represents 3.25 percent of the nation’s GDP—a larger share of the economy than tourism and agriculture. The nonprofit arts industry alone generates $135 billion in economic activity annually (spending by organizations and their audiences) that supports 4.1 million jobs and generates $22.3 billion in government revenue. Arts are good for local merchants. Attendees at nonprofit arts events spend $24.60 per person, per event, beyond the cost of admission on items such as meals, parking, and babysitters. Attendees who live outside the county in which the arts event takes place spend twice as much as their local counterparts ($39.96 vs. $17.42)—valuable revenue for local businesses and the community. Want to partner with the York Fringe Festival in 2019? Scroll down for more information, we’d love to hear from you! The arts are like a universal language that brings people together across barriers like age, income, education, race, and religion. They can help create a sense of neighborhood identity and pride. If creating community through the arts is important to you, we need your help. The York Fringe Festival is back August 21-26, 2019, bringing theatre, dance, music, spoken word, video, and more to venues all across York City. The first York Fringe Festival featured twenty-seven performances over five days, entertaining 872 audience members. The arts bring people together. In today’s climate, that’s more important than ever. Please join us and don't fear the Fringe. Have a question about the upcoming Fringe? Want to connect with us about sponsorship? Would you like to host a Fringe performance? Use the form below or email us and we’ll be in touch shortly.